For homeowners looking to keep their pipes pristine, avoid drain issues, and quickly obliterate plumbing problems, we recommend ProClean Concentrated Drain Cleaner. We advise our customers to get into the habit of a regular monthly treatment with ProClean Concentrated Drain cleaner (available in quarts and gallons) as the absolute easiest way to keep their drains from clogging. By employing natural bacteria, ProClean Concentrated Drain Cleaner is able to transform grease and organic buildup into carbon dioxide and water that dissipates easily. A treatment with ProClean will also coat the inside of the drainpipe, which prevents buildup from gaining a foothold in the future. 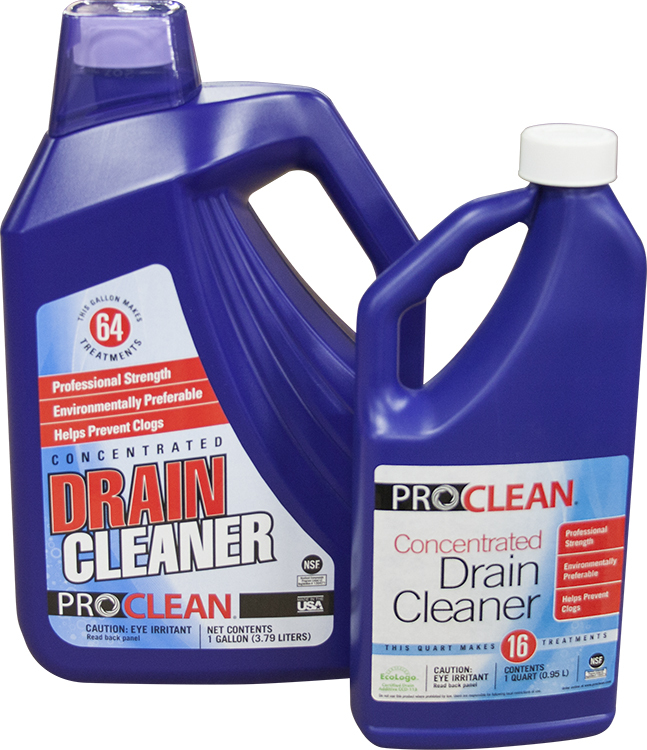 ProClean Concentrated Drain Cleaner is safe to use on all drainpipes, no matter the material. That’s because it uses all-natural biological elements. You can use ProClean on copper, PVC, and iron, and in kitchen skins, bathtubs, laundry drains, floor drains, and showers. ProClean Concentrated Drain Cleaner is NSF Approved. This product is safe to use in and around food areas.